Posted in Blog	| Tagged Biblical fiction, Historical fiction, Jesus	| Enter your password to view comments. 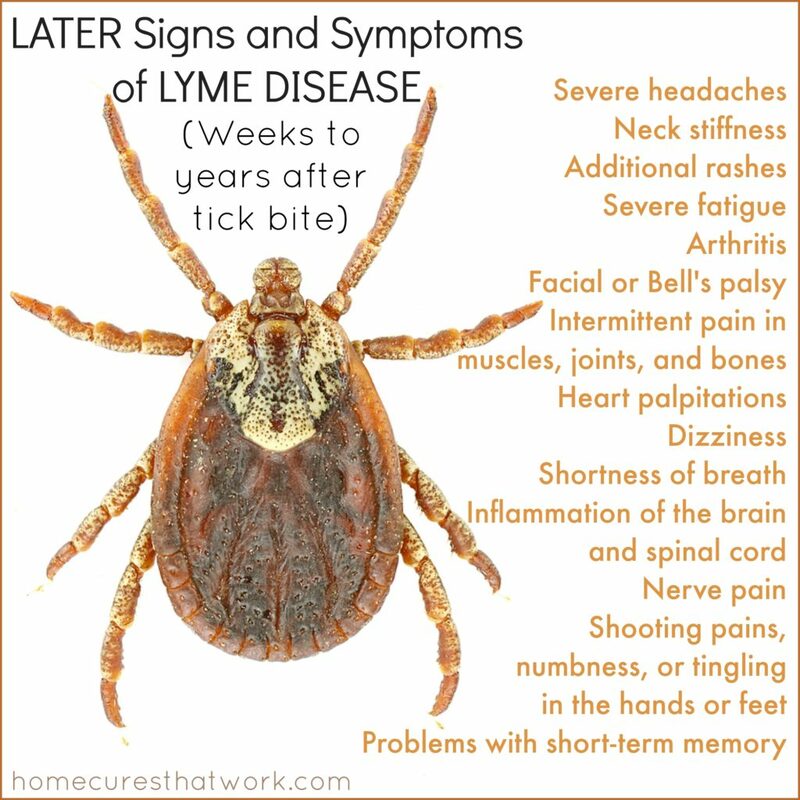 In my last post, I shared my daughter’s story and tips to help you catch Lyme disease early. But how can we protect ourselves from getting it in the first place? 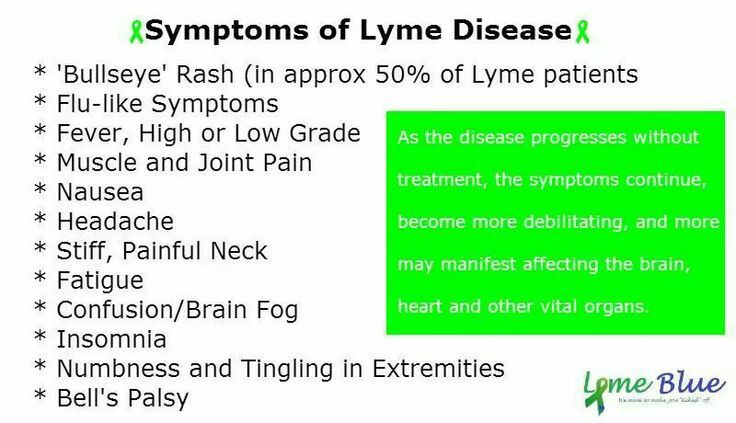 Studies show at least 20% of people with Lyme disease don’t remember a rash, and the number could be as high as 73%. And, unfortunately, the other symptoms can mimic everything from the flu to rheumatoid arthritis. Many with Lyme have been misdiagnosed with depression, multiple sclerosis, or chronic fatigue syndrome. So how can we decrease our chances of getting this debilitating disease? I wish I could tell you the tips are easy, but for busy moms and nature-lovers like me, they certainly aren’t. However, they might just prevent our minds and bodies from giving out on us before their time. So here they are! 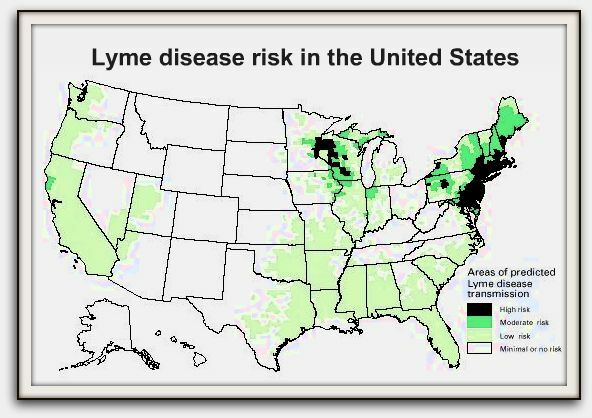 The more we do, and the more often we do them, the more we’ll lower our risk of getting Lyme disease. • Walk in the center of trails to avoid brush, tall grass, and leaf litter. • Don’t sit on logs or lean against trees. 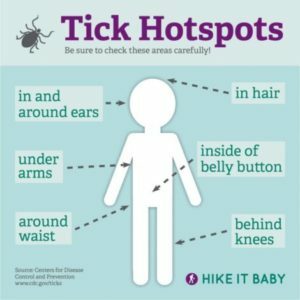 • After being outdoors, check yourself and your children for ticks. Don’t forget hidden places like the underwear area and scalps, armpits, and belly buttons. • Bathe or shower within two hours of coming inside. • Toss your clothes in a dryer for 5-10 minutes to kill any ticks that may have traveled inside with you. 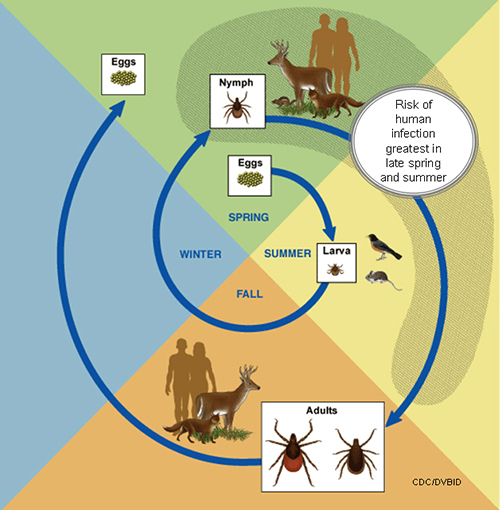 • If you live in a high-risk area, hire a professional to spray for ticks between mid-May and early June. 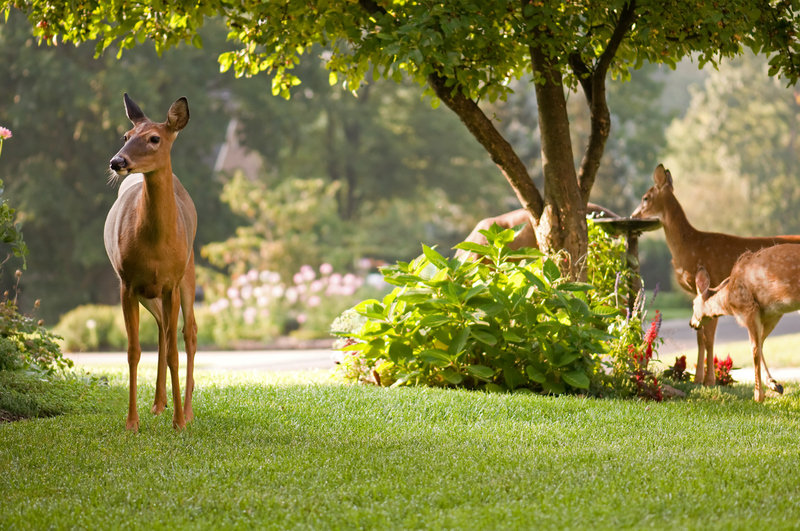 • Discourage deer from coming into your yard through building fences and removing plants they enjoy eating. Those are the best tips I’ve found for preventing this debilitating disease. I don’t expect us to do all of them, but every one we do will help lower our risk of getting Lyme. Family picture from November 2014, just months before we moved to Maryland. Photo by Stephanie Kuecker. Since we moved to Maryland in May 2015, one of mine has been that my husband, daughters, or I would get Lyme disease. We had traded the cold, crime, and bad traffic of Chicago for an adversary the size of a sesame seed. How could we fight a foe we could barely see? As you may know, Lyme disease is spread through the bite of infected blacklegged ticks. Also known as “deer ticks,” these bugs are much smaller than other ticks. Depending on the stage of their development, they range in size from a pinhead to an apple seed. But the damage they cause can be life-changing. Our neighbor had to retire early and still suffers from pain in his back and knees. A sweet friend from church struggles with brain fog, debilitating fatigue, and physical limitations. Combined, these problems led to her having to go on disability. In both their cases, they had Lyme disease for years before it was diagnosed. And untreated Lyme disease can cause arthritis, meningitis, nerve paralysis, and even heart problems. In contrast, the CDC says, “People treated with appropriate antibiotics in the early stages of Lyme disease usually recover rapidly and completely.” Hence, the incredible importance of discovering the disease quickly. Five years ago, my father also contracted Lyme disease, but his story gives us hope. Because he realized what it was within a week, he was able to recover from it without any permanent damage. His story and ours are why I’m writing this blog: to help you recognize the disease early before it wreaks havoc on your health. Even more important perhaps, for parents, is to recognize it in your little ones. 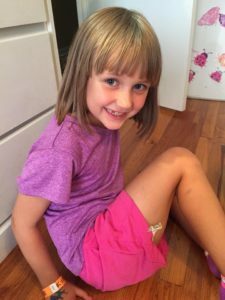 Michaela on her seventh birthday–Tuesday, August 28, 2018–with her baby bearded dragon. 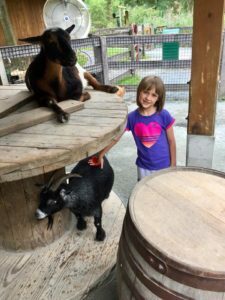 Our seven-year-old, Michaela is strong, energetic, and independent. She delights us with her inventiveness, her creativity, and her surprising and perceptive observations. But on the way home from her late August birthday party, she started complaining she was cold. The next day, on the way home from the zoo, she said the same. That evening—the Friday before Labor Day—she was hot to the touch. I took her temperature, and it was 103.4 degrees. Michaela at the Maryland Zoo the day we discovered she was sick. My husband, Mark, checked her from head to toe and found nothing unusual. Since her doctor’s office had closed by that time, he took her to a clinic, and they concluded she had a virus. On Labor Day, after days of no symptoms except chills, fatigue, and fevers, I discovered a rash. At first, I thought it might just be a pressure mark from her long nap on Mark’s recliner. The middle of the night proved that theory wrong. Just after midnight, Michaela came into our bedroom crying. Her head hurt, and her fever had spiked to 103.9. I checked the oval red mark on the back of her upper thigh, and it was still there. I gave her medicine and a lukewarm bath and left a voice mail for the on-call pediatrician. When he called back, he advised me to bring her in first thing in the morning. Michaela eating lunch 24 hours after starting antibiotics. 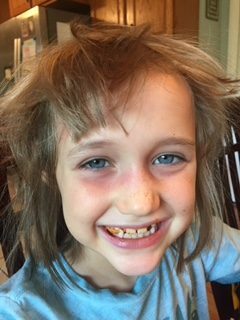 You can still see the red circles around her eyes, but her bright smile is back and her hair is messy, because she was playing superheroes. I did, and another doctor examined her and ruled out common causes of fever. Then she called in a third doctor to check out the rash, which was clearing in the center. They agreed she probably had early Lyme disease and started her on antibiotics. First, don’t just check for the rash once. The circular red area usually takes 3 to 14 days to appear after the tick bite and can appear as late as 30 days later. Some people never get the rash. Second, don’t forget to check your scalp and areas where your skin creases when you stand. Third, don’t assume it has to look like a bull’s-eye. 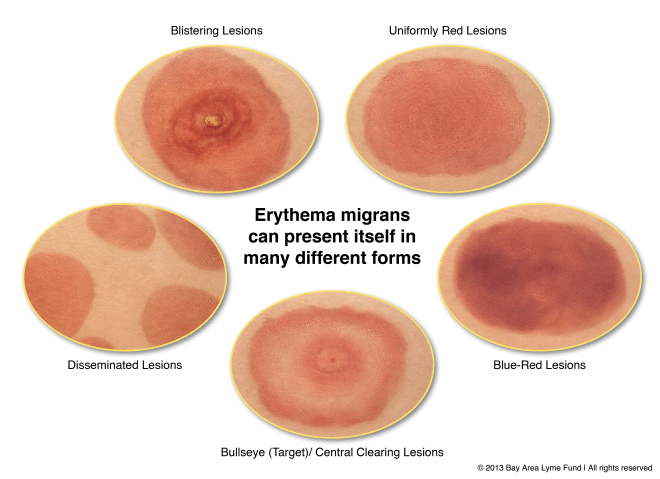 The erythema migrans can take many forms (see the chart below). In my dad’s case, his rash looked like a normal rash but then spread to other parts of his body. 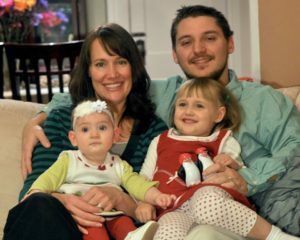 In Michaela’s case, the rash didn’t appear until several days after her symptoms started. If your fever or a loved one’s persists, check for the rash again and see your primary care physician. So now we know a little more about how to catch Lyme disease early. But how do we prevent ourselves and our loves ones from getting it in the first place? Check out 11 Ways to Lower Your Risk for Lyme. Has God ever given you a seemingly impossible dream? Eric, when the Lord called you to tell the conclusion of Liddell’s story, what led you to first write a screenplay? People often say, “write what you know.” I shared so many commonalities and experiences with Liddell, I thought, who better to write about this? I had a theatre degree from Michigan State University and, at the time, was working on my Masters of Divinity at Concordia Seminary. And I have always loved film. Everything came together in my mind, and I decided to set out on the great adventure of telling this story at the highest art level we have, cinema. How did you then come to write the book version? I was throwing pebbles at the windows of Hollywood for a while without much success. I happened to go to a film festival in Naples, Florida and made some wonderful connections, one of whom became my agent. She suggested I write a book version of the script, so I wrote that first. Eventually, she shopped that to the publishing houses. Tyndale liked the concept, but desired more of a biographical approach. We agreed to the terms, and the rest is history. 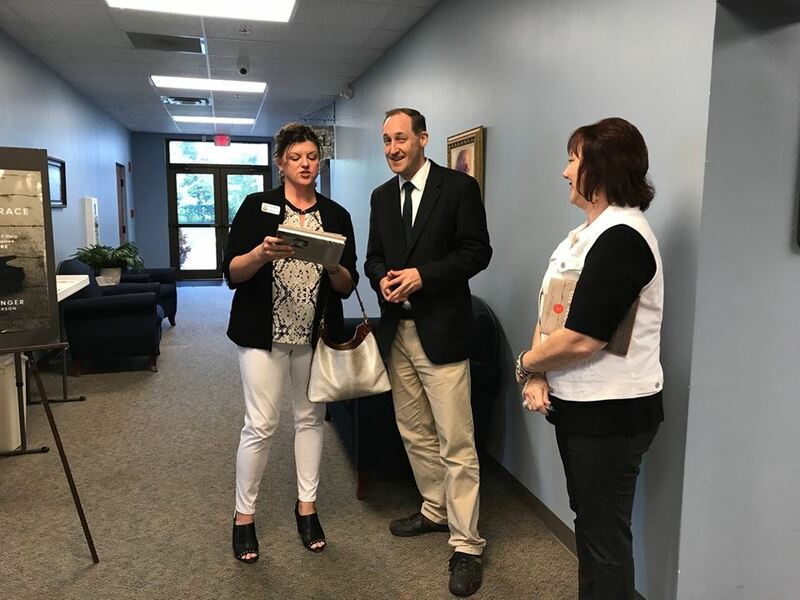 Eric with agent Rebeca Seitz (left) and co-author Eva Marie Everson at a book launch party. Tell us about your partnership with director, screenwriter, and film producer Howie Klausner. He’s had an important role in some major motion pictures like Soul Surfer, The Grace Card, and The Secret Handshake. Most noteworthy, he wrote the script for the 2000 Clint Eastwood film, Space Cowboys. How did you first start working with him? He’s a busy guy. At the moment, he’s working on Reagan (which he also wrote) starring Dennis Quaid. I met Howie at the aforementioned film festival. We hit it off in conversation. I pitched him my idea, and he really liked it as he has always loved Chariots of Fire as well. 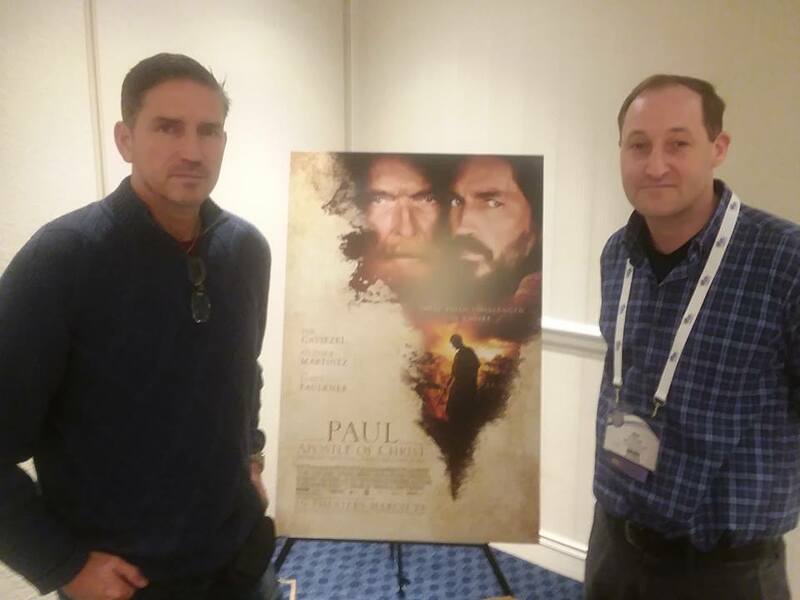 Eric T. Eichinger (right) with actor Jim Caviezel. 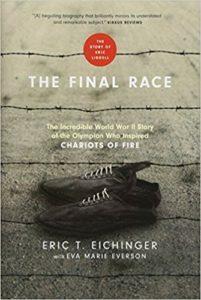 Finally, Eric, what’s the next step in turning this Chariots of Fire sequel into a movie? 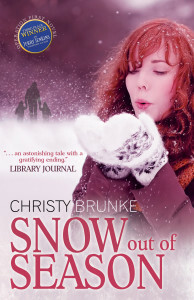 Do you have a tentative release date? It’s very hard to get a publishing deal, and it’s exceedingly more difficult to get a film made today without a blockbuster comic book superhero. The screenplay has some heat and has taken a few interesting creative twists along the way. All I can say now is, originally, I wanted to tell the story of Eric Liddell, because he inspired me so much. 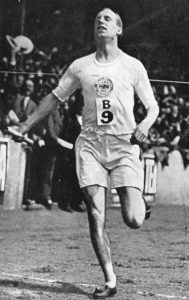 Hollywood seems more interested in telling the story of how I was inspired by Eric Liddell. [Tweet that!] Stay tuned! Readers, want to learn more? Watch this short Youtube video where Eric talks to Howie Klausner on the set of The Identical!​ Just click here! Has God ever redirected your path? Eric, when did God first call you to teach English in China? 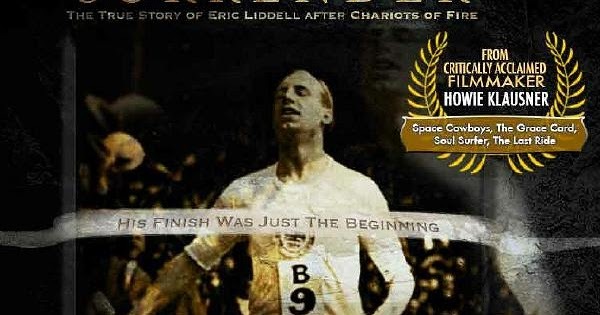 Did Eric Liddell’s story inspire you? I was working in New York at the time and preparing for overseas mission work with my denomination. I was interested in Germany, but there were no slots available. They suggested China, which did not appeal to me at all. Over time, I began to fall in love with the idea of serving in China. Then, last minute, an opportunity in Germany opened up! All of a sudden, I had a tough choice to make. During that deliberation, I remembered Liddell was a missionary in China, and that comforted me. I asked the mission board where they would most like to place me. “China,” they said. “Then send me to China,” I responded. 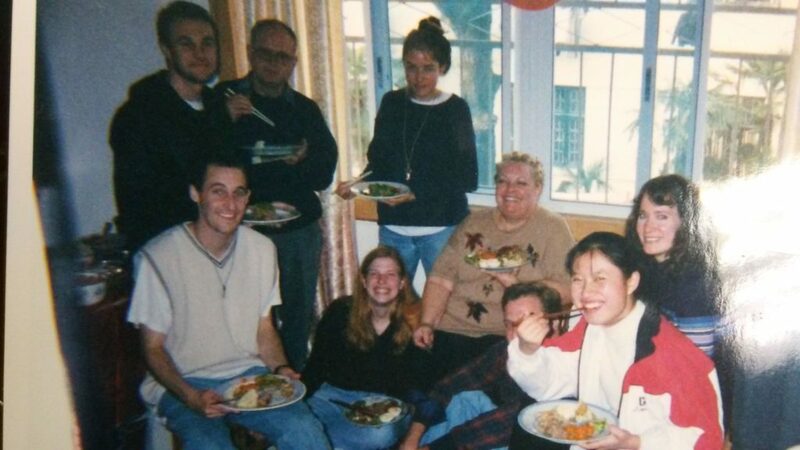 Me (far right) and Eric T. Eichinger (left, sitting) enjoying a meal at Connie Mom’s house during the years we lived in China. Tell us about your tour of Eric’s old haunts. What struck you the most as you quite literally followed in his footsteps? I spent time with his daughters in Toronto and trotted around one of the fields where he used to race track meets. His niece also gave me a personal tour of his church and other places in Edinburgh, Scotland. But I would say the most powerful episode was standing in the very hospital where he died in Wei Fang, China. I had come to the end of his story, and I knew I wanted to do something about it. 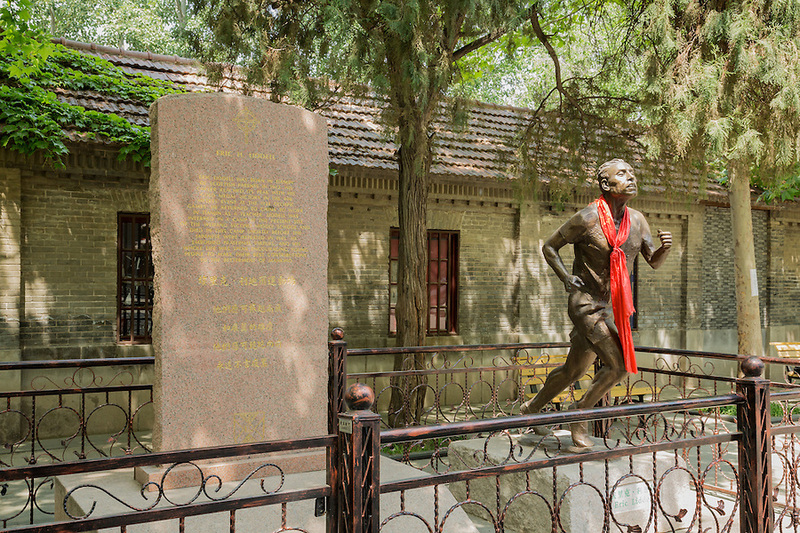 A Memorial to Eric Liddell in Wei Fang. How did Eric’s three daughters respond when you reached out to them? How did you first get in touch with them? I emailed them via the leadership at the Eric Liddell Centre in Edinburgh. 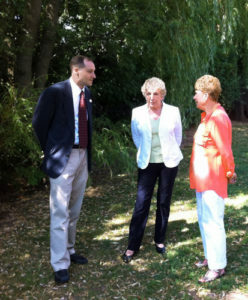 Eventually, I visited them in Toronto and have kept in touch with updates over the years. At first, they were skeptical of my motivations and protective. Many “like me” had irritated them in the past. They warmed up soon enough, and, to my delight, have given exceedingly positive reports of what I’ve written. How did you meet your wife, Kara? 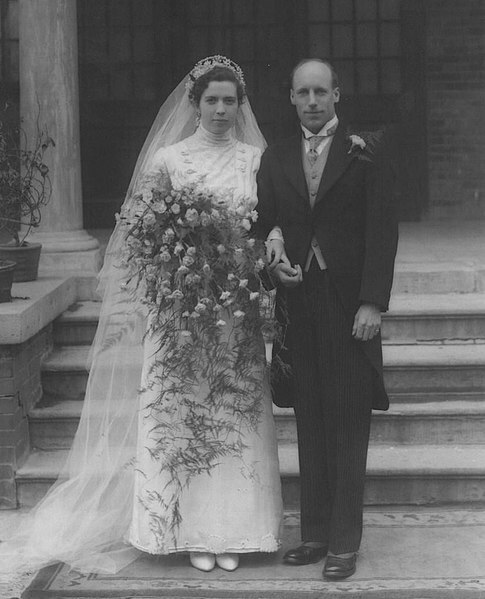 In what ways is your love story like Liddell’s? In what ways is it unlike his? Aside from meeting in China, I would say we both had to endure long seasons apart from each other. It was a bittersweet blossom of romance. Do you ever plan to return to China? If so, in what capacity? Kara and I have led one mission team to China since. Eventually, we would love to share the experience with our children. Beyond that, I’ll let God decide. He knows where to find me. In my final interview with Eric, we discuss the movie version he’s working on with Howie Klausner. Click here to read it now!